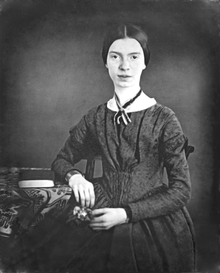 This week’s favorite poet is none other than Emily Dickinson. Some argue that she might be the most important American poet and some argue that the title belongs to Walt Whitman. But no one can deny that she was incredibly talented, not even the trolls on the internet. She was born on December 10th in 1830. She wrote almost 1,800 poems but only a few of them ever published during her life. Her poetry was starkly different for the time period (the late 1800s) in which it was published. Most of her poetry utilizes short lines, slant rhymes, and random use of capitalization and punctuation. Some of her works were altered when published to fit what was standard. Her poems are also known for dealing with death and the thought of immortality. Personality wise, Emily was known as a bit of reclusive and barely socialized. Most of her friendships were maintained through letters. She also never married. One day when baking she fainted which may have been the primary cause of her death. She did not commit suicide as commonly believed. But the fumes from the oven left her weakened and made it difficult for her to breathe.